Sam vs. Lupus: Ok, now I'm feeling better accessorized. Ok, now I'm feeling better accessorized. As I've spoken about before, I don't like to look sick. I like to look… well, the best word I know is, perhaps unsurprisingly, French: soignée. It translates too, roughly, “well put together,” but that doesn't capture the same feeling. The idea is that, no matter what else is going on, and what serious medical crises I may be experiencing, at least I can look nice. “My platelet count may be so low as to put me in the hospital, but at least my earrings match my scarf!” That kind of thing. 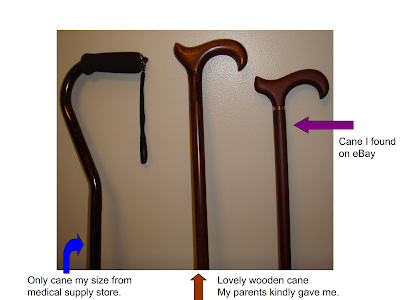 This was why I was so irritated by the fact that the medical supply store only had one cane tall enough for me. Looking put together requires choices. You can't accessorize if you only have one of the given accessory. Girly? Maybe. Obsessive compulsive? Quite possibly, but there's not a heck of a lot else I can control right now. 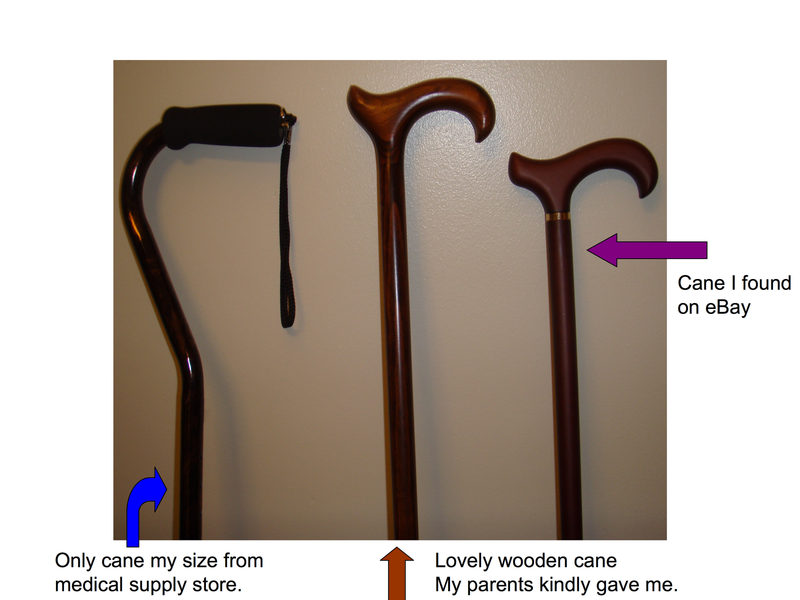 So I am happy to report that, through the kindness of my parents and a fortuitous eBay purchase, I am now in a much better place in terms of cane choices. And this is not purely vanity; canes are supposed to fit a certain way, and if (like most women) you have shoes of varying heights, albeit even slightly, this can pose a problem. So now I have a lovely cane to go with my dress suit and low but heeled pumps, one to go with completely flat shoes, and one that is adjustable. So thanks, mom, dad, and the random eBay seller who had one at the low-end of my height range for sale at the right time! But especially, thanks mom and dad! A word to the wise: if you ever get the antique kind of cane with a rapier hidden inside (handy if you frequently get into duels) do not attempt to take it on an airplane. I've heard the TSA gets really huffy about that.